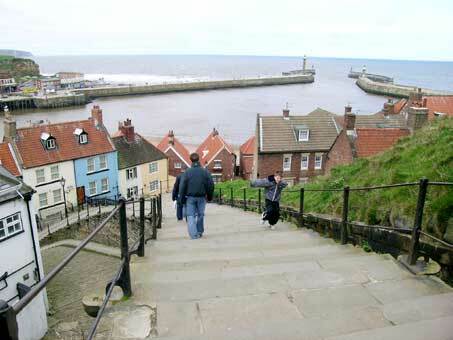 Whitby is a coastal town on Yorkshire's east coast. 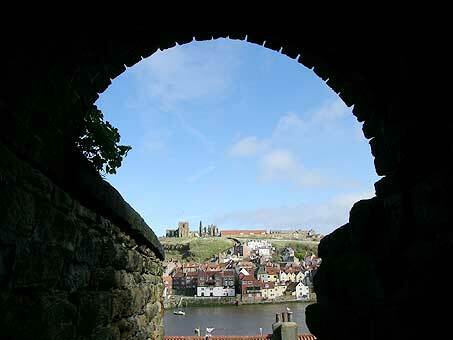 Whitby has a wonderful history, a ruined abbey, a working harbour, a delightful collection of red roofed pantile cottages, narrow cobbled streets, and claims to have the country's best fish and chip shops! 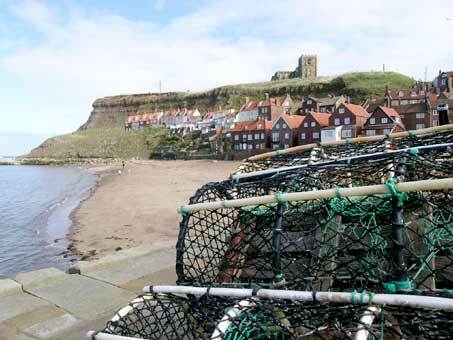 The town is also close to the scenic North York Moors National Park and the unspoilt fishing villages of Staithes and Robin Hood's Bay. 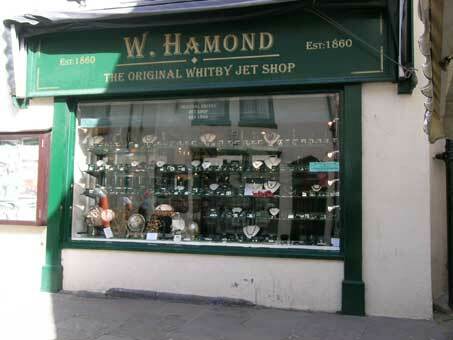 Whitby's history includes connections with whaling and the explorer Captain James Cook. 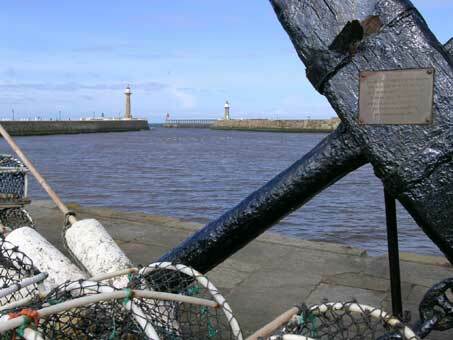 It was probably in the nearby fishing village of Staithes that Captain Cook decided to go to sea, before he subsequently became an apprentice to a Whitby ship owner in 1746. 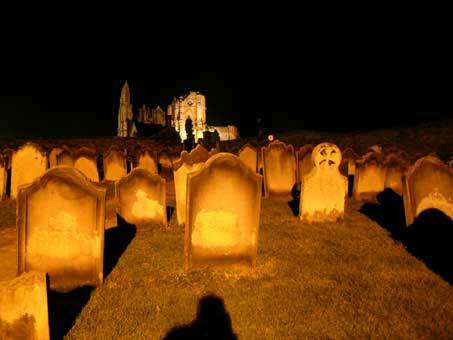 The town's historical past is revealed in monuments that dominate Whitby's east and west headlands and the harbour. 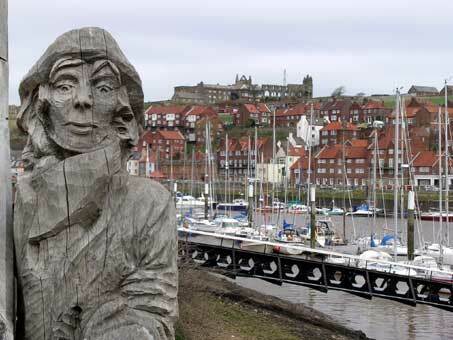 For 80 years (1753-1833) Whitby's fishermen were engaged in whaling. 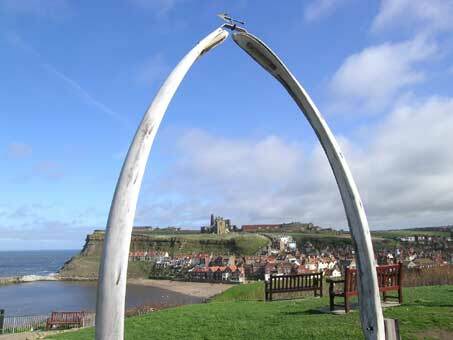 The whale jaw bone arch on the West Cliff - picture 1 above, was presented to Whitby by Norway in 1963. The monument to Captain Cook (picture 2) includes a carving of the Resolution, one of Cook's four ships. 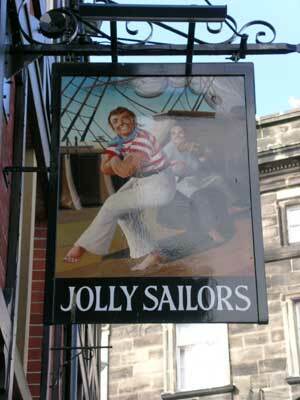 Other links with Whitby's seafaring past are remembered in its pub signs and wooden carvings by the quayside - picture 4. 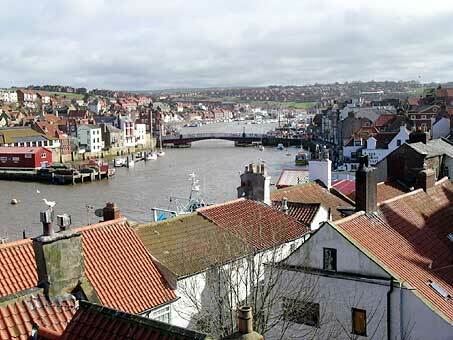 Whitby is divided in two by the River Esk. 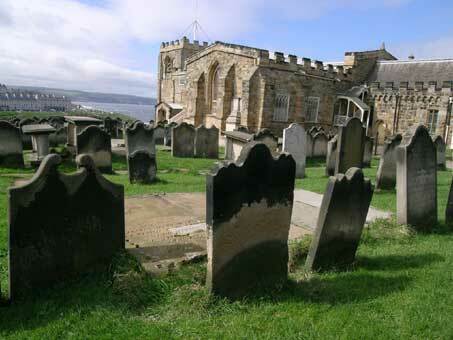 St. Mary's Church and Whitby Abbey are on the eastern headland and are visible through the whale arch in the picture sequence at the top of this page. 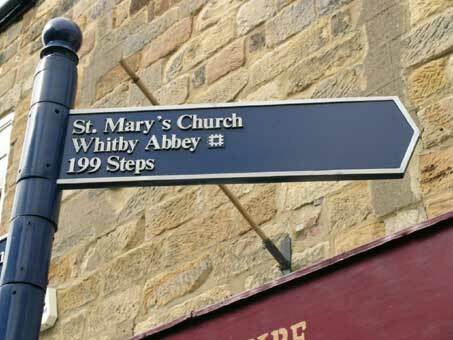 Although the Abbey is accessible by road, the able bodied should experience climbing the 199 steps to the summit! As you return to the town you can always hear those on the ascent count each step, just to make sure that there really are 199. These steps have associations with Bram Stoker, as he based much of his Dracula novel here whilst staying in Whitby in 1890. Charles Lutwidge Dodgson (better know as Lewis Carroll) also set some of his work and poems in Whitby, as he was a regular visitor. 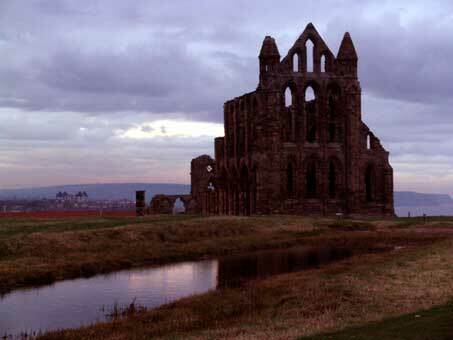 The Abbey's history dates back to AD675 when St. Hilda founded a monastery. The present structure is from 1078 and is now in the care of English Heritage. The parish church of St. Mary has a Norman tower and an 18th century interior, the work of local shipwrights. 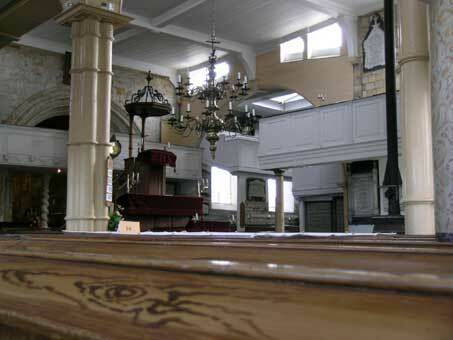 Of particular note in the church are the box pews (some emblazoned with the words 'For Strangers Only"), but equally impressive are the galleries and a three storey pulpit - picture 2 above. The pulpit has built in ear trumpets that enabled the hearing impaired wife of a former rector to listen to her husband's sermons! 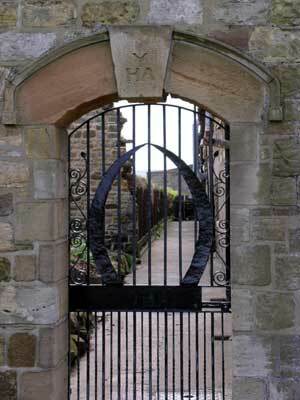 The miniature whale bone arch in picture 3 forms part of a nearby gate. There are good views of the abbey and St. Mary's Church from the West Cliffs. See picture 4. Whitby jet is a local, semi-precious stone, (formerly fossilized wood). When polished it is shiny black in colour - hence the phrase 'jet black'. Whitby claims to have the best fish and chips in Britain. 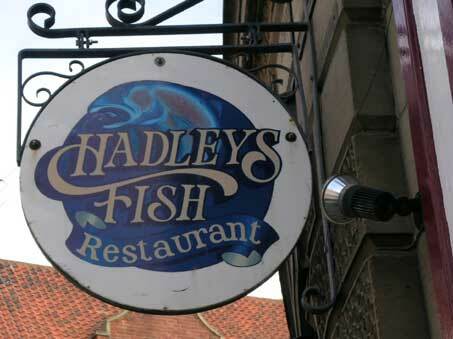 Those we had from Hadleys Fish Restaurant were delicious! The ancient wooden stock anchor in picture 3 above was caught in the nets of a fishing vessel in 1981 and was presented to the town by its crew. St. Mary's Church dominates the skyline above the harbour entrance - picture 4. 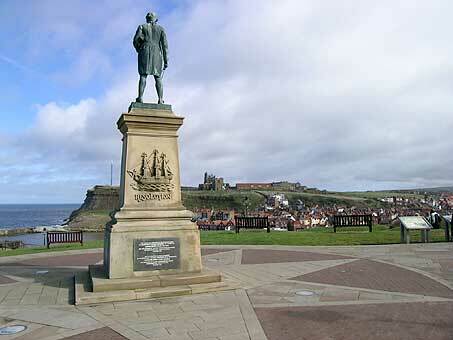 All Captain Cook's four ships - Endeavour, Resolution, Adventure and Discovery were built at Whitby. 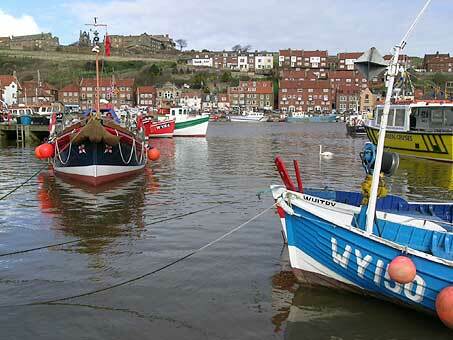 Whitby harbour is now home to commercial fishing boats and private yachts. 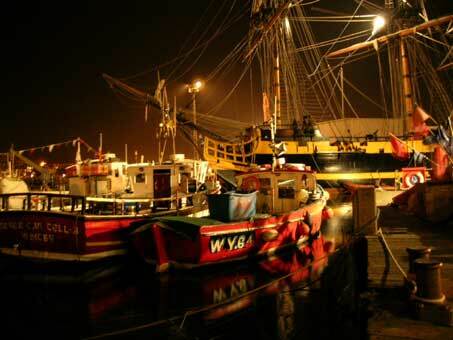 An authentic replica of HM Endeavour (but only 40% of the ship's original size) is berthed in Whitby Harbour. At the time of our visit the ship Grand Turk, used in the ITV "Hornblower" series was on the Endeavour's moorings. Grand Turk is the yellow and black vessel in picture 3. Click the image for an enlarged view. The sculpture in picture 4 above is of Captain Scoresby and his son keeping watch from the crows' nest. The Scoresbys were whaling captains during the Napoleonic era but were also scientists, inventors and explorers of Arctic regions. Scoresby junior did much pioneering work with magnetic compasses.